DATE POSTED ON http://www.balboa-island.com ALL YEAR!!! For those of you who love my newsletter—and I hear from you every day—it has been a long dry spell since the last one in November. Actually, it has been wet and wild—which does not lend itself to publishing and hand delivering the Island Breeze on Balboa Island. We are moved and the 21st Annual Balboa Island Garage Sale is the next event coming to Balboa Island. The date appears on http://www.balboa-island.com all year long—if you need to check the date—another easy way to remember is that it is always the first Saturday in May. Which this year happens to be Mother’s Day weekend as well—so get your flowers delivered after noon on Saturday!!! I rarely get any applications before April—so I am eliminating the earlier 2500 run of applications—I think the decision to participate is more last minute with a few exceptions. At the end of February I attended an event at UCI with Sir Richard Branson. He spoke on entrepreneurial solutions to global issues as part of the UC and Orange County Center Living Peace Program. Sir Richard was asked how he became an entrepreneur. He replied that he just wanted to be a publisher, but found that he had to be involved in all parts of his business. He was a person that had an idea and wanted to make it a reality. He spoke to us about taking risks. Sir Richard feels we all need a challenge and if we do not take risks, we cannot achieve anything. He, like Warren Buffett and Bill Gates, knows that with extreme wealth comes extreme responsibility. A business should be fun, profitable and most of all Make a Difference. And don’t take yourself seriously while you are making money!!! Sitting next to me at the event was Keith O’Derek of Upfront Productions. Keith is a Filmmaker and Entrepreneur who compiled over 300 hours of documentary and interview footage—resulting in the 1999 hip-hop feature Straight from the Streets. Keith has produced wonderful videos on subjects ranging from President Obama to Jonathan Strickland, a record holding pilot—at 18 years old!!! Jonathan is now preparing to become the youngest pilot to fly a Lear Jet around the world. Keith does a lot of video work with celebrities—including Larry King (picture above). He has recently been working for Fox Sports and compiling footage for a new Straight From the Streets feature. 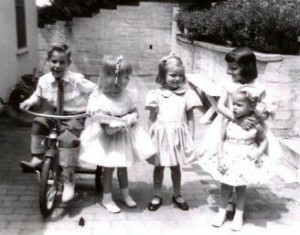 DO YOU RECOGNIZE THE BOY ON THE BICYCLE—let me know - the story of this photograph to be revealed next month!!! Just read about the 21st Yard Sale Weekend on http://www.balboa-island.com via http://www.talesofbalboa.com Me, my wife, sisters and friends have done the Yard Sale for years. I live in Claremont, but my family has a house on the Peninsula (since 1961). I park my car on the Friday night on the Island and then ride our bikes over on Saturday. We almost always fill the van up with “goodies”. We have planned our weekend in May and can’t wait. As for the City not making money on the yard sale, the past few years I have noticed more and more Parking Enforcement Officers. Last year I counted at least 3 officers handing out Parking Tickets right and left (they will ticket for anything). I am sure they will be back. Also, Marine Avenue was booming with business. I can’t wait until May and another GREAT Balboa Island Garage Sale. You keep it going and remind the City they make a few dollars too!! PS I remember when you could ride bicycles on the Balboa Island Board Walk—A Long Time Ago!!! Paul Auben, whose business card appears in this newsletter is affiliated with a company called itrip.com This company DOES work with VRBO, although I was given incorrect information when I called VRBO in November. Paul can help you manage your VRBO property if you do not live here in Newport—or even if you do!! Call Paul at 949.923.0698 or go to his site http://www.NewportBeachVacationProperties.com and see exactly what he will do to help you with your vacation rental. Imagine my surprise when Ike Eilers walked into my office at Island Flooring just before we moved in November. I could not believe there was a real Fuller Brush Man on Balboa Island. I opened up my purse and pulled out a Fuller Brush Comb that my mother gave me in grade school—it still looked brand new after 50 years plus!!! I guess that is why my mom bought their products. I lost my Fuller Hair Brush in college, so I bought one on the spot. I now have it in my possession and I love the way it gently brushes my hair and does not break it off. Ike’s ad appears below as well as his phone number and e-mail. Call or e-mail him and get some of those fabulous Fuller Brush Products!! Unfurnished 3BR 3BA On the water !! Close to South Bayfront and Ferry Landing. Call 949.292.6262 to see. . The Balboa Island Artwalk is the premier showcase for talented local artists and marks the start of the Island’s summer season. 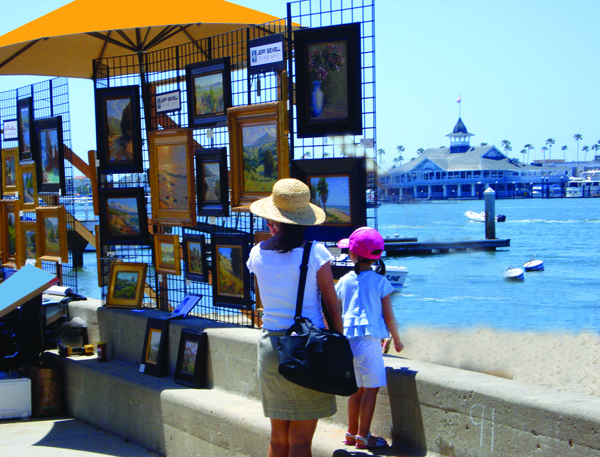 Celebrating its 17th Anniversary, the Artwalk will take place on Sunday, May 15th, from 9am to 5pm along the South Bayfront Promenade of Balboa Island. Admission is free. This fine art show features 90 artists exhibiting paintings, fine jewelry, blown glass, sculpture, and photography. Spectators will enjoy live music throughout the day on 4 stages along the walk. Performing musicians include the Retros, Don Ross Duo, Garry Gould, Rick Sherman and Alan Remington, Jim Roberts, and Grant Peakcock. Limited-edition Artwalk posters and t-shirts will be available at Sapphire & South Bayfront. Local restaurants will be open to serve breakfast, lunch, and dinner. The OC Cruiser will be providing free shuttle service. The Balboa Island Artwalk is presented by Mary Hardesty Realty and by the Balboa Island Improvement Association. AARP was established by insurance salesman Leonard Davis in 1958, after he met Ethel Percy Andrus. Ms. Andrus was at the time helping teachers get health insurance through the National Retired Teachers Association. According to Rooney, Davis saw the opportunity to sell medical insurance to the elderly rather than just retired teachers and for that purpose put in $50,000 establishing AARP. Davis established the Colonial Penn Insurance Company in order to control AARP, selling millions of dollars in insurance to its members through advertisings in AARP’s magazine Modern Maturity and for several years Colonial Penn Insurance Co. became one of the most profitable in the U. S. In 1978, after a 60 Minutes report exposé, AARP got rid of Colonial Penn Insurance Co. and signed up with Prudential Insurance Co. According to critics, until the 1980s AARP was controlled by businessman Leonard Davis, who promoted its image as a non-profit advocate of retirees in order to sell insurance to members. In the 1990s, the United States Senate investigated AARP’s non-profit status, with Republican Senator Alan Simpson, then chairman of the Finance Committee’s Subcommittee on Social Security and Family Policy, questioning the organization’s tax exempt status in congressional hearings. MOVING TO OUR NEW LOCATION TO BE OPEN MID APRIL—UNTIL THEN BY APPOINTMENT ONLY OR WE CAN BRING SAMPLES TO YOU!!!! Marmoleum—Natural Linoleum from Linseed Oil—Great Colors! Anyone can sell you something, but we are here to educate you and to make sure you choose the right Floor for your home or business. 35 years in Orange County LOTS of REFERENCES ON and Off BALBOA ISLAND! !